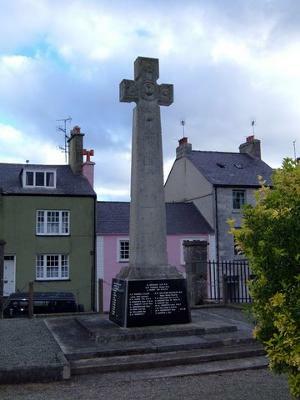 The monument to the men and boys of Beaumaris stands in front of the town church. Another Celtic cross, but this time so elegantly tall, it seems to be trying to see over the roof-tops across to the Straits. The carved inscription from the Great War has all but faded into the stone; the names of those killed in both World Wars read bright and clean etched on slate. Death has no respect for class. Together with the humble privates, Major R.G. Williams Bulkeley of the Welsh Guards, a son of one of Anglesey's premier families is also remembered. An obelisk stands on Cremlyn Hill just outside Beaumaris, in honour to one of Major Bulkeley ancestors - Sir Richard Bulkeley. Until 1925 the Bulkeleys owned Beaumaris Castle. below of sacrifice and loss? and castle by the green. and shared desires left unsaid. But you are dead now.